Regimes Fall, Oil Prices Spike; What's Obama To Do? "In this unprecedented time of ordinary people rising up to do the extraordinary—toppling multiple governments in the Middle East—we look at what the reverberations mean for the market, economy and energy sector." *Geopolitical tensions swell along with oil prices, pushing the stock market lower. *The absence of a longer-term oil-supply shock suggests the price spike could be short-lived. *Consumers will take a hit, but the broader economy should avoid a double-dip recession. First this is a well researched article politically speaking can be used to make points for both sides in my opinion. What remains clear to me is we still need to be less dependent upon foreign oil, especially from the Middle East and Venezuela, although increased energy efficiency has somewhat reduced the dependence of the economy on oil. As a positive we are currently at about 8% energy consumption as a percentage of gross domestic product while in the early 1970s, US energy consumption as a percentage of gross domestic product was about 16%. 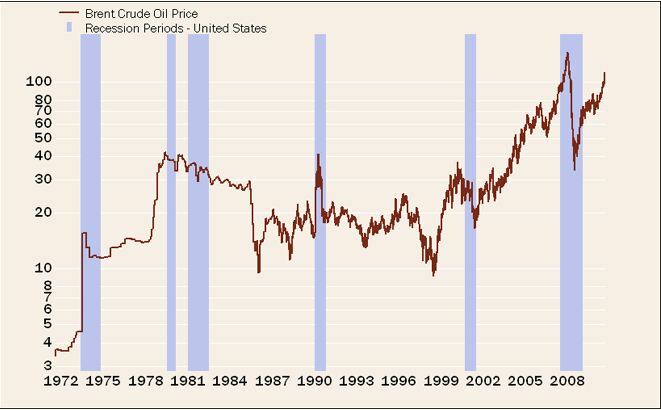 It is easy to blame "big oil" and they certainly are reaping the benefits as they always do during times of spikes in prices, but to place all the blame there is lazy economics. Is it not true that as an example when say a cold snap hits Florida and many oranges are destroyed that you can expect to pay more for orange juice and often those dealing in this commodity also make more money, yet do we hear the news media and other angry at the "orange juice barons"???? If we must place blame, let's place blame where it belongs; with President Obama, his liberal cohorts (most notably the news media), and the radical (communist) environmental movement. As for the news media, currently as per the mainstream news outlets, they are only running stories about the spiking oil prices at a rate of 1 to 15 when to compared to 2008 and news reports then blaming Bush. Talk about corruption in the media!!!! I would also have to add that even President Bush (W) has some blame, and that is not having the "huevos grandes" to stand up to the liberals in congress and their allegiance to the new home of communism: the radical environmental movement, especially when he had a majority in both houses of congress. *Vastly increase drilling in Alaska, which the current drilling has shown to not be harmfil to the surrounding environment, in fact quite the opposite. A new study says drilling on Alaska's Outer Continental Shelf (OCS) could make Alaska the eighth largest oil resource province in the world — ahead of Nigeria, Libya, Russia and Norway. *We have heard it stated many times, no blood for oil; well we gave blood and "got no oil". Time to make Iraq pay us back for their freedoms. *Do not just promote solar cell technology, but promote the more efficient Stirling solar dishes. The Stirling engine makes solar power so much more efficiently than photovoltaic solar cells can. Currently for home use, credits are only given for photovoltaic solar cells, not Stirling solar generators.